In today’s installment of completely impractical technology, Up digital Bureau and Unteleported tech agency have created what they claim is the first-ever analog Twitter client. Dubbed Tweephone, the homemade device allows users to slowly crank out their 140-character-or-less messages using a rotary phone. 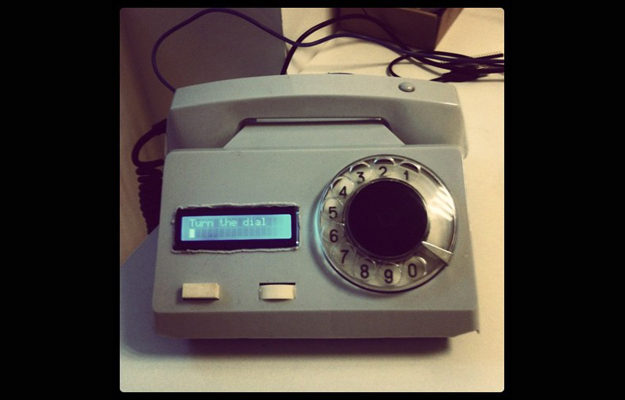 The Tweephone uses the popular Arduino open-source microcontroller, which translates the dialing of the rotary phone into letters. So, to write an “a,” you dial the 2 one time. To get a “b,” you dial 2 two times. (Think of typing out text messages on a feature phone with T9 Word turned off.) Once your message is complete, simply hang up the headset, and your tweet is automatically posted to Twitter. As you can imagine, typing out a message on the Tweephone is anything but fast. But this could be interpreted as a good thing, we guess. “If you still think 140 characters limit isn’t enough to express oneself, you should try Tweephone — it will change your mind once and for all,” writes Unteleported on its blog. Unfortunately for all you hipsters out there, Tweephone is a one-of-a-kind device, so you can’t buy one. (Though, with the right know-how, you could build one yourself.) But you can follow Tweephone’s musing on its own personal Twitter page.